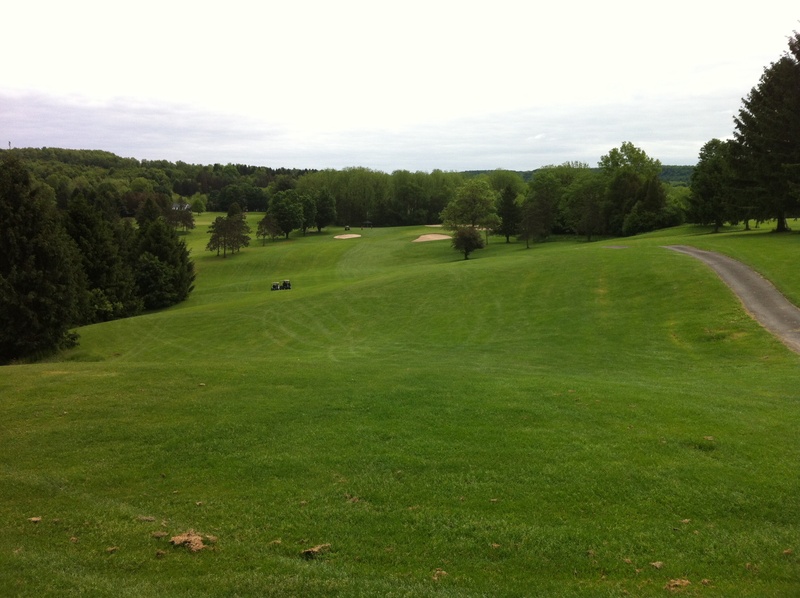 Looking down the first fairway from the tee at hole No. 1 at Green Lakes State Park in Fayetteville, N.Y. The people of Central New York flock to Green Lakes State Park for all sorts of recreation. There are beaches for swimming. Two lakes, Green and Round. Camping. Bikers all around. Runners and hikers and hills. Snowshoe and cross-country skiing trails come winter. 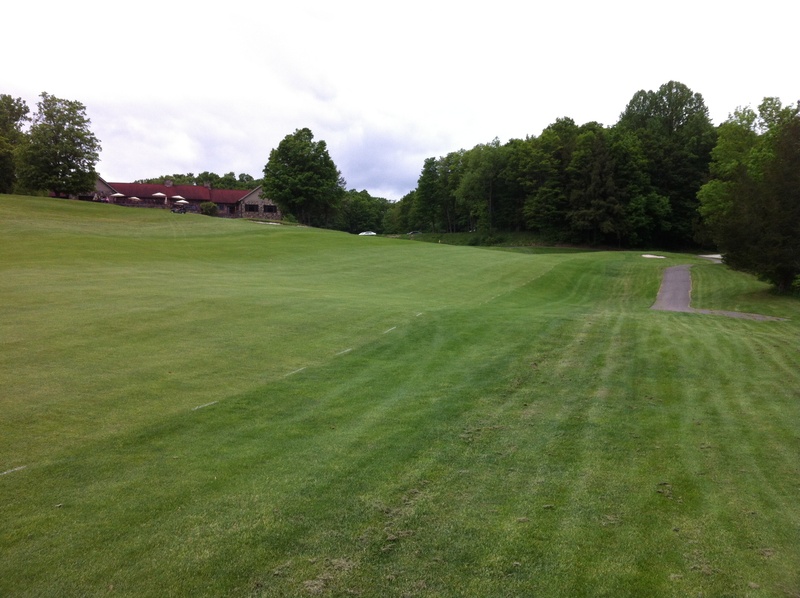 Yet this is still the fourth installment of “Golfing with KP, Tater and I,” because Green Lakes also is home to one of the most — OK, today I’ll call it the most — scenic courses in our area. 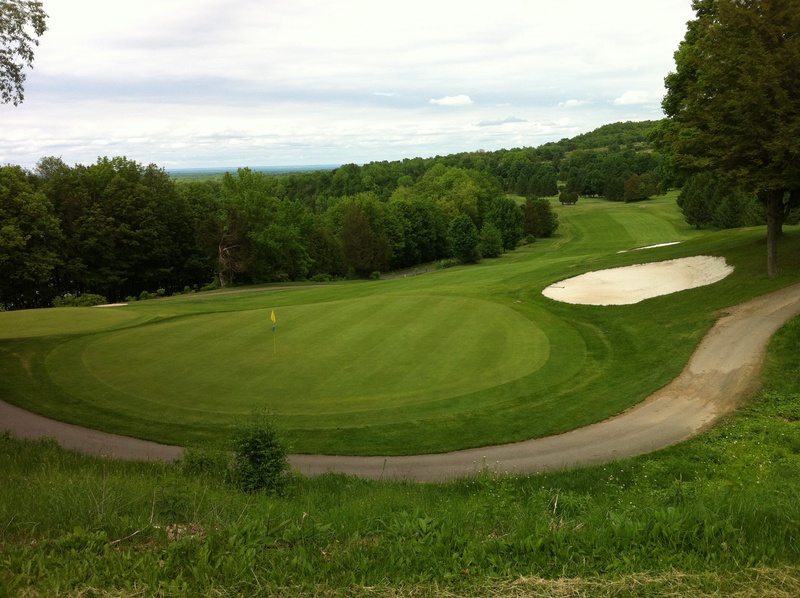 It was designed by famed course planner Robert Trent Jones, truly making the most of the hills and valleys. Walk up to the first tee, look down the winding fairway to the green far below. The game is on. After we smacked our drives, we got back into our carts. With the hills and some distance between greens and tees at several of the holes, this course is not an easy walk in the park, although we’ve done that in the past with pull carts. This year, a new and lower fee has kicked in. It only cost us $27 for greens fees and the riding cart this weekday. The first green is guarded by bunkers. It takes a couple of well-struck and placed shots to make the first green in the regulation two. It took us all three shots yesterday to get between those two sand traps and on the putting surface. The ninth is a par five that winds back up the hill toward the club house restaurant and patio. What goes down, of course, must go back up. The front nine concludes with an even more winding, longer, par-five that goes up the hill toward a brick clubhouse that includes a bar and restaurant with a patio perfect for unwinding after your round. More on that later. We’re not at the ninth green yet. 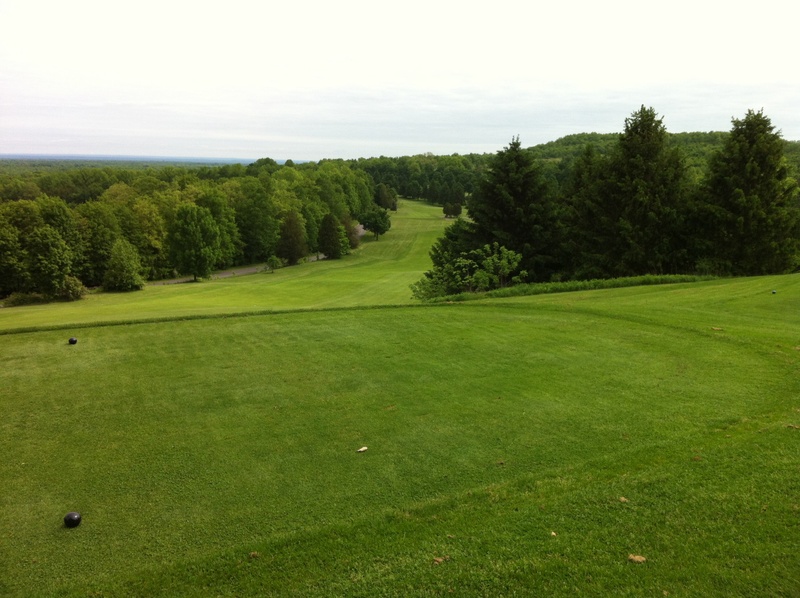 The fairway is lined with trees to the left, but it slopes severely to the right. The right side also is lined with trees. And a ditch. On the far side of the ditch is the road that winds through Green Lakes State Park. 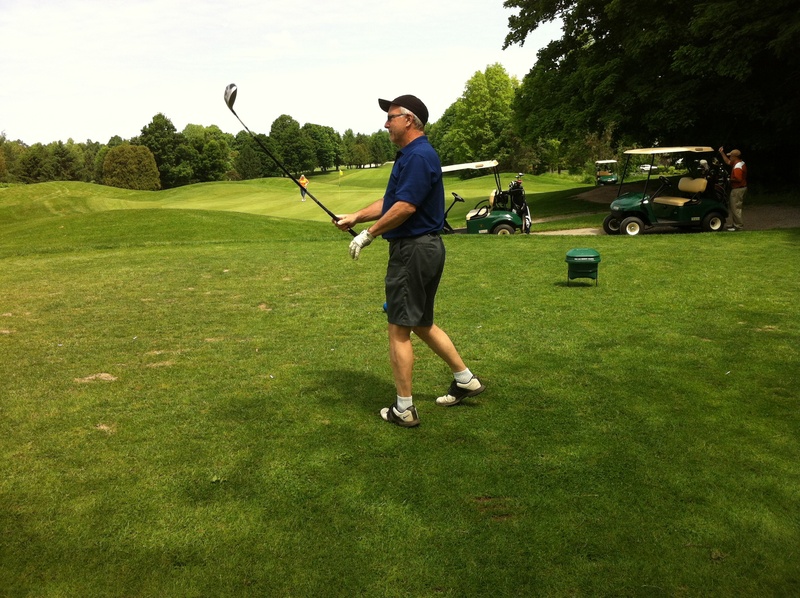 Runners and bikers can be seen flinching when golfers yell fore! from the tee for drives sliced in that direction. Car drivers can’t hear the warning. The ninth green we played, from behind. 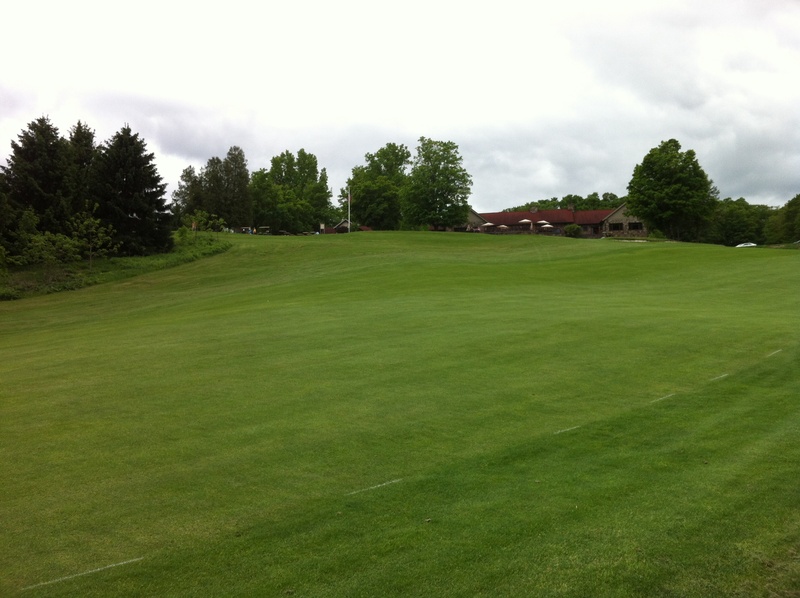 One of the interesting features of this ninth holes is that it’s built with two greens. Yesterday, the top left green was in play instead of the lower, right green. Both are tough, but I do believe the top left green is even harder to keep your approach shot on. 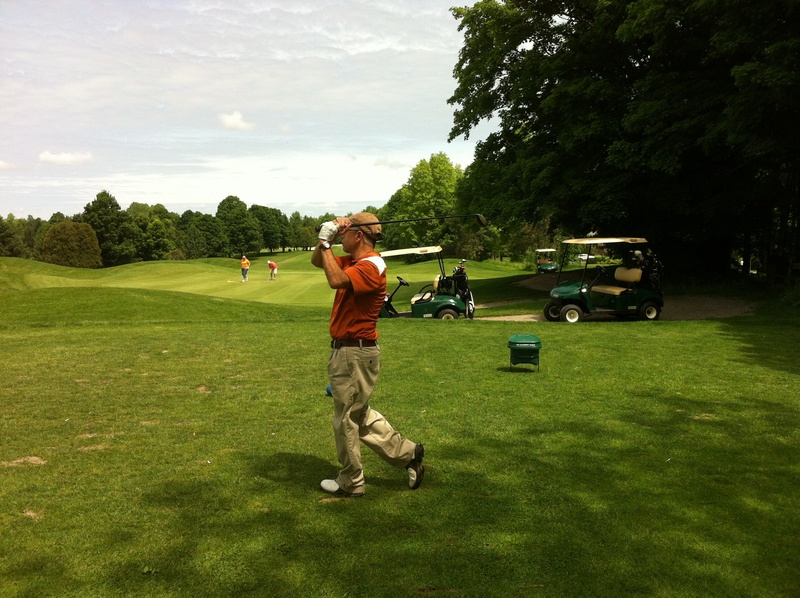 Tater, in balance after hitting his tee shot on the par-three sixth hole. The greens were running very fast. They were in great condition. But that meant it was hard to get the ball to stop near the hole. Or to stop on the green at all. Or to stay in the fairway if you had the tendency to slice the ball toward the right. Ahem. Me, yesterday. KP watches his shot, same hole. At the 10th tee, the course superintendent came up to me while Tater and KP were still getting a bite and beverage in the clubhouse. 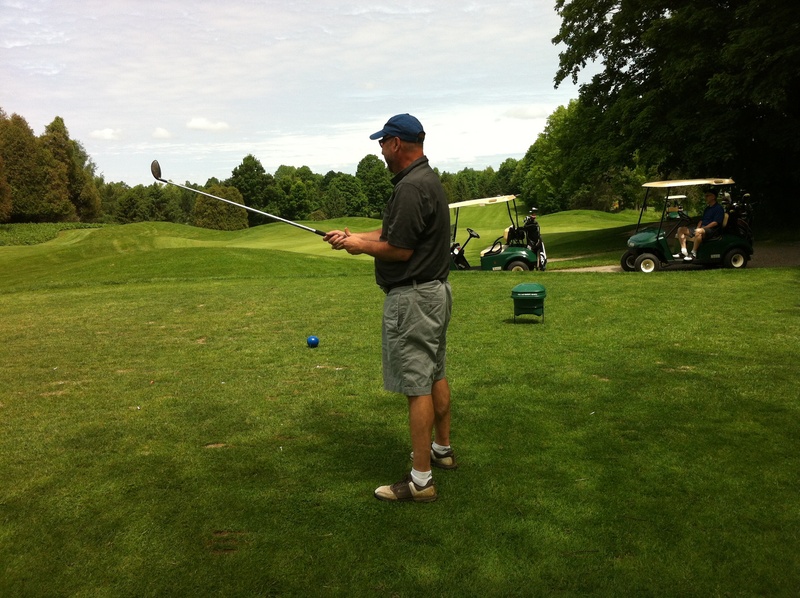 He was in search of Tater, who in his last position at the big daily, reported about the Central New York golf scene. Tater also introduced KP and I to Rocky Kelly, the well-known Central New York pro. There are perks to playing with Tater. We told both what good condition Green Lakes was playing in yesterday. Me, last on the tee, watching my shot. After the round, we retreated to that patio, ordered a plate of nachos to share, grabbed some Labatt Blue Light, and talked a little about golf and a lot about life. We picked our best shots of the day. Tater picked a chip in from just off the green for birdie on the part-four fifth hole. Kinpin selected his second shot on the closing 18th, a laser hybrid to the green that led to a tap-in par. I picked a center-cut drive on the 334-yard, par-four 17th that led KP to ask, “Is that Beels’ ball on the 100-yard marker?” KP won the most skins, Tater a tad behind, me at last drawing blood at that No. 17. Both Tater and KP were off from work yesterday, so we were able to hang out like friends through three decades can. Wives are good. We are happy. Daughters are good. We are happy. We’re all getting together at a college graduation-wedding anniversary-plus bash Sunday at KP’s. We are happy. ← Is that another ‘Big Fat Greek Wedding’ you’re spying on, Houdini? You don’t have to be one for golf to love Green Lakes, that’s for sure. Thanks, Amy! I’m going to sit here and enjoy these photos. I like when you tell us a story, Mark. It’s like we’re golfing together. Have a great Friday! When you visit Syracuse, bring your clubs and be our fourth, Audrey! You have a great Friday, too. I know nothing about golf, but it looks beautiful out there. People love the terrain and nature, Dora! Every Navy Base in San Diego county has a golf course. I spent much time there. Green Fee: Two bucks. Two bucks at the base course. That, my friend, was a pretty good bargain. Do love your wit My Friend. We are commoners, indeed, Lance! 🙂 Uncommon as we are! Yeah! We love our lives, don’t we Mark? Cheers to you my Uncommon Friend. Beautiful course mark. Great post. We are lucky to have such a setting here, Paul. Thank you, Leyla. The setting is gorgeous at this park. Time spent with old friends, happy wives and happy daughters? Sounds like perfection to me! Once in a while we all have life knocked at the same time. Yay! this is so beautiful, mark. and i’m so happy you had a happy day with the boys and you are all happy. it’a a nice place to be. ) ps – now i am craving nachos! The salsa and sour cream they served them with were quite tasty, Beth, but they did not met the cheese enough. But goodness, I was hungry by them. Nachos is a good craving! Tater and KP. I can only think of MASH. And then you smashed your drivers. I only read your golf posts because of Tater’s name. Well….and because you wrote them. And….because you have fun. But not because I get golf. Don’t you like the pretty pictures this time, Colleen? I know you love our Tater. He’s appealing. I do love the pictures. And I cannot admit to checking out any taters!!!! I have been told by Kerbey they are right for swing dancing, and except for the rubber spikes, I agree! “A little about golf a lot about life.” I agree with the rest of your readers Mark. You’re a great storyteller. I’ve only made it as far as Mulligan’s Diner on the golf course but I can follow along and live vicariously through your game. Thanks pal! Keep at it dear friend. What a wonderful life I must say when all is good. Sometimes that happens. Once in a while, Kim. Absolutely beautiful. Glad you had a wonderful day. This has helped with convincing me to pick up some clubs and pretend. One day I’ll hit the green, Mark. I’ll have to work on my form so I don’t clock myself in the skull before actually hitting the green. It is a great social game, Chris, and that’s why you should pick it up. No skull-clocking, please, though.